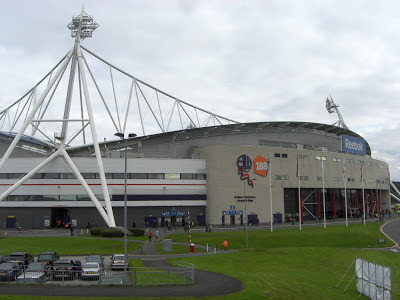 My twenty-first stadium of 2012 was on Saturday 20th October 2012 at the Reebok Stadium in Horwich, Greater Manchester. 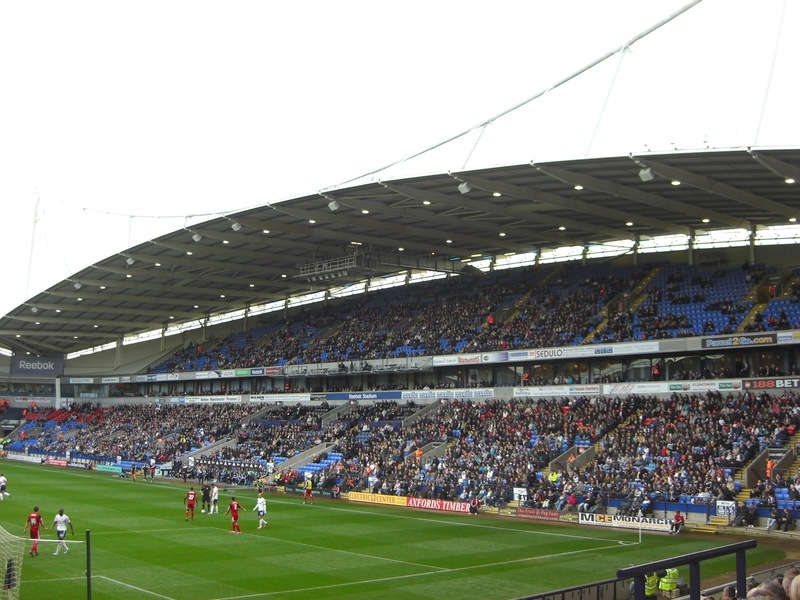 The match was Bolton Wanderers vs. Bristol City in the Football League Championship. 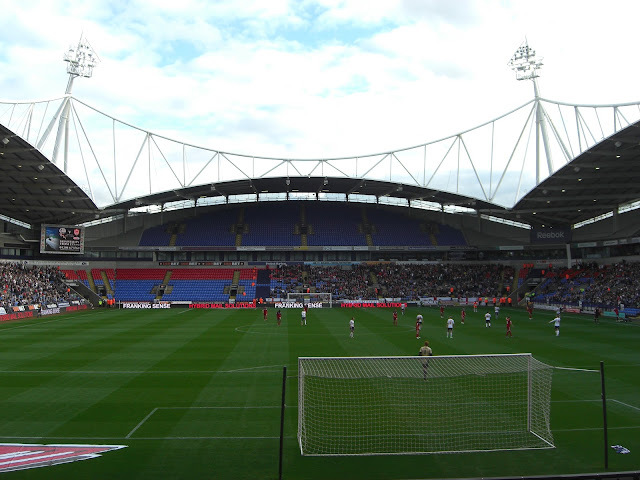 The Reebok Stadium sits in a retail park on the outskirts of the town of Horwich in Greater Manchester. The ground is less than 400 yards from Horwich Parkway railway station, around 5 miles west of the centre of Bolton itself. It has been the home of the club since 1997 when they left their previous Burnden Park home where they had played since 1895. The stadium is two-tiered on all four sides giving an overall capacity of 28,723. The lower tier is a bowl which extends the whole way round the venue but there are four separate upper tiers which are semi-circle shaped. In between the two tiers are a large number of executive boxes which go most of the way round the ground. The South Stand is given over to away fans with the remaining stands being taken up by the home support. The West Stand is the front of the stadium facing out onto the main road as well as containing the main reception area. Behind the Nat Lofthouse Stand on the east side of the venue is Bolton Central which consists of the club shop and ticket office. There is a hotel behind the South Stand and a large car park adjacent to the North Stand. The game produced the first goal early in proceedings as the visitors took the lead in the 3rd minute. A Bristol City cross was sent into the area and was met with a spectacular Steven Davies overhead kick which flew into the Bolton net. 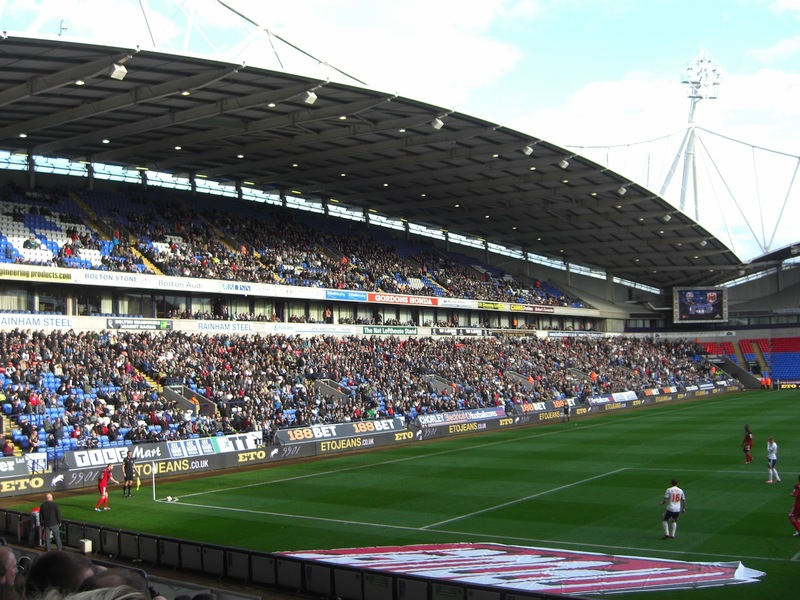 This stunned the home fans into silence and things got worse for Bolton after 20 minutes when Davies netted a second, this time from the penalty spot after a trip in the box. The home side knew they had to get back into the game quickly and in the 31st minute were awarded a free-kick just outside the penalty area. 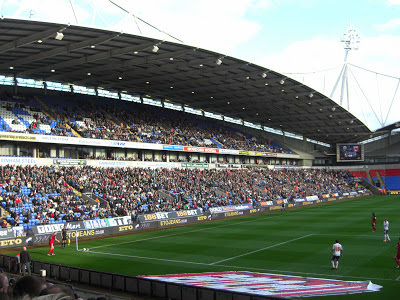 Chris Eagles drove a low shot into the corner of the net to reduce Bolton's deficit. The teams went in at half-time with Bristol City leading 2-1 but the second 45 minutes was a very different affair. Bolton went for it right from the off and put the away side under real pressure with a series of attacks. They kept chipping away and just after the hour mark Kevin Davies threaded a pass through to Jay Spearing who tucked it past Tom Heaton in the Bristol City goal to take the score to 2-2. Bolton were dominant from this point on but just when it looked like the game was heading for a draw a smooth passing move by the home side culminated with Martin Petrov through on goal. Petrov made no mistake as he lifted the ball into the net to complete the Bolton turnaround. With this goal coming in the 82nd minute the visitors still had time to respond but they squandered a couple of late chances and ended up leaving with nothing as Bolton wrapped up all three points.